NEW YORK (TASS) —. The administration of social network Twitter announced in its statement on late Thursday that it registered attempts to influence mid-term elections in the United States in 2018 by means of accounts, which allegedly originated from Russia, Iran and Venezuela. 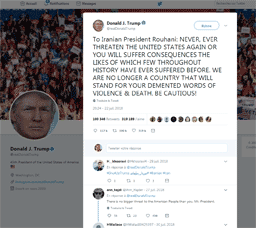 The statement said that after a thorough analysis of the activities on the social network during the elections, attempts were registered to convince Americans against voting, however, most of the Tweets originated in the United States. “Our ongoing efforts have uncovered an additional 418 accounts. We cannot render definitive attribution to the IRA for these accounts, although most appear to originate in Russia, and much of the behavior mimics the activity of prior accounts tied to the IRA”, the statement added.